The new Gold Tone EB-5 Electric Banjo is available! Check out the sweet tone this thing can get! Available from BanjoCrazy. Call Paul Roberts, 970-731-3117. 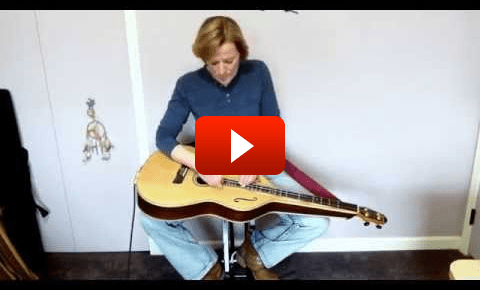 Using a custom-made Remo 8″ pre-tuned banjo head that needs no tensioning hardware. This head enhances tuning stability. The countoured mahogany body is well-balanced and features our slimeline Canadian maple neck. A stacked humbucking pick-up eliminates feedback problems and our heavy-duty “Terminator” tailpiece will accept loop-end or ball-end strings. Scale 25-1/2″ Weight 6 lbs. The banjo guitar, is known by many names, most commonly banjitar, but also: guitanjo, guitar banjo, guitjo, banjar, bantar or ganjo. It is a six-string instrument consisting of a six string guitar neck attached to a traditional bluegrass banjo body. It is tuned like a standard guitar played by guitarists who desire the sound of a banjo. The instrument should not be confused with the six-string bluegrass banjo (played by Sonny Osborne and others), which retains re-entrant banjo tuning and a high-pitched drone string, simply adding a low G string to the five string banjo, nor with the zither banjo, a similar instrument from the late 19th/early 20th century, which was made in both five- and six-string models. The Gold Tone Dulciborn mates the Weissenborn guitar body to the mountain dulcimer to provide the extended tonal range that dulcimer players have been longing for. Want to be HEARD? Play a Dulciborn! Musicians nowadays are always looking for inspiration. If you’ve ever picked up a new instrument to play around with, you’ve likely experienced this rush of excitement as new sonic possibilities are discovered. 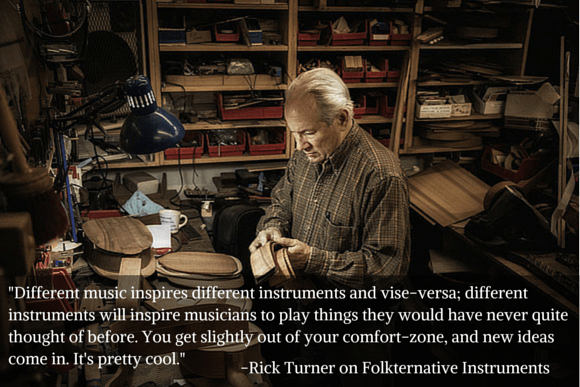 That’s what we aim for in our Folkternative line of musical instruments. We meld the excitement of new sounds, with the knowledge and hard work that you’ve already put into learning an instrument. The result is pure enjoyment! Gold Tone Dulciborn from Banjo Crazy. Call Paul Roberts at 970-731-3117. Gold Tone EB-5 & EB-6 Have Arrived! ≈ Comments Off on Gold Tone EB-5 & EB-6 Have Arrived! The new Gold Tone electric banjos EB-5 & EB-6 Have Arrived! We use a custom-made Remo eight-inch pre-tuned banjo head that needs no tensioning hardware. This choice greatly enhances tuning stability. The contoured mahogany body is well-balanced and features our slimline Canadian maple neck with 24 frets. A strong humbucking pick-up eliminates feedback problems and our heavy-duty “Terminator” tailpiece will accept loop-end or ball-end strings. Our EB-5 is a new lower-cost edition, with simple appointments and a penetrating onstage presence. We use a custom-made Remo eight-inch pre-tuned banjo head that needs no tensioning hardware. This choice greatly enhances tuning stability. The contoured maihogany body is well-balanced and features our slimline Canadian maple neck. A stacked humbucking pick-up eliminates feedback problems and our heavy-duty “Terminator” tailpiece will accept loop-end or ball-end strings.